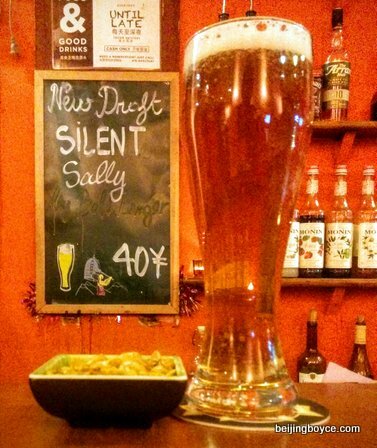 Cafe de la Poste rotates craft beer by local brewers Bell Banger and the current option, Silent Sally Lager, is my favorite yet. Much fuller and smoother than mass-produced beers like Heineken and Carlsberg and with touches of sweet malt and a bit of bitterness at the end. For some reason, it reminded me of a heavier Molson Golden! 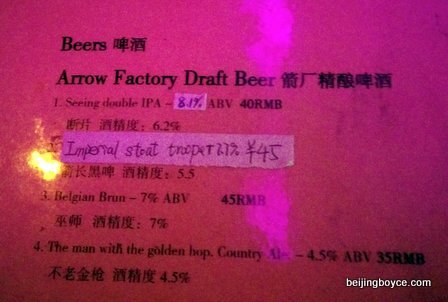 I’d happily drink two or three of these at 元40 per pour. 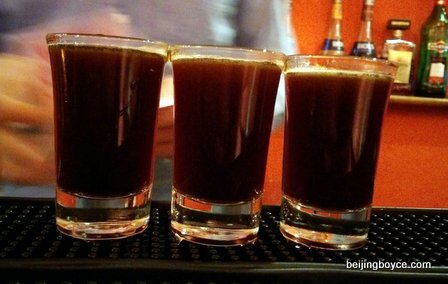 With our beer finished and the tour set to begin, we kick-started our engines with Spark Plugs–espresso, vodka and Kahlua. There are a lot of variations you can do with this shot, such as by using vanilla vodka, and all of them provide a nice boost. 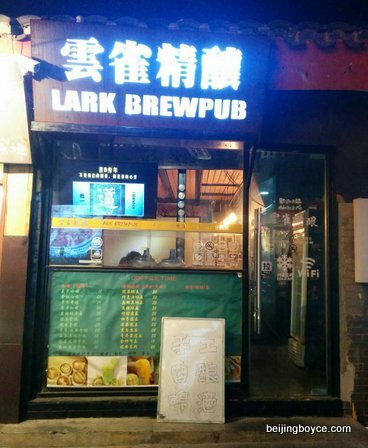 We started at Lark Brewpub, close to Beixinqiao subway stop, and grabbed seats at the bar in this fairly busy place. 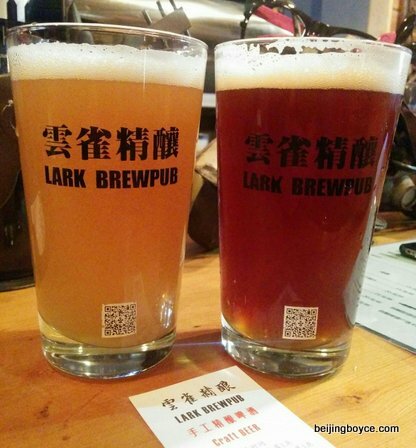 Lark has about a half-dozen beer options plus infused alcohols. The lager smelled faintly of bananas and wheat and is very light or, to put it less politely, anemic. The pale ale offered more body and flavor but–I’m not joking–smelled a bit like McDonald’s chicken nugget barbecue sauce. 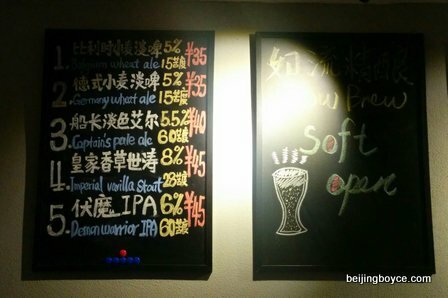 While the staff is nice, these beers did not impress, but I’ll visit again soon and give some of the others a try. 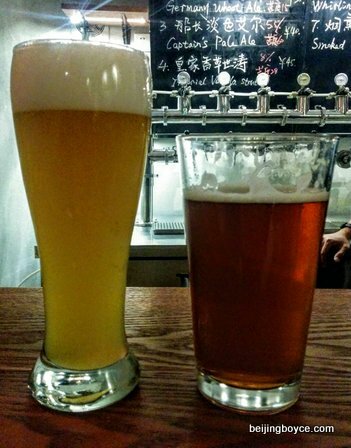 As we headed to our next stop, we happened upon the ‘soft opening’ of a new joint, Flow Beer. 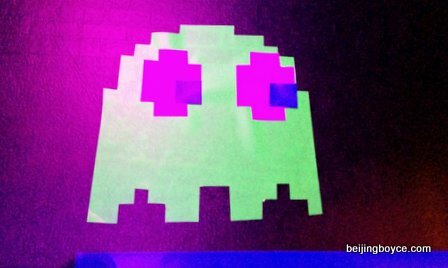 The partners at Flow have day jobs and plan to run this two-story venue in their spare time. 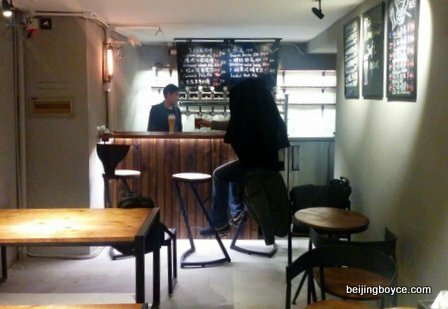 They learned to make beer at home via books and videos and have five options on tap as well as a small food menu. I had the German wheat beer, which was fresh with a mild banana aroma and a tight and almost spritzy body. If this is their first effort, we can expect good things. You can find Flow just up the alley across from Cafe de la Poste and close to Vagabond. 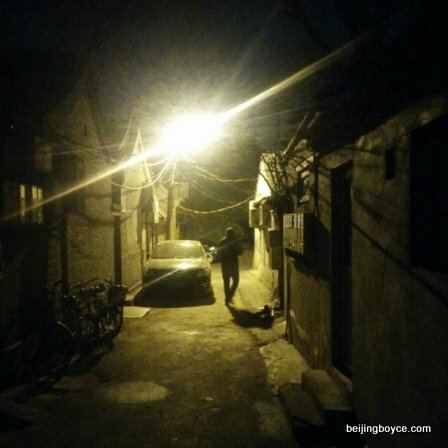 Bungalow ranks as one of my top-five joints these days and didn’t disappoint on this night. 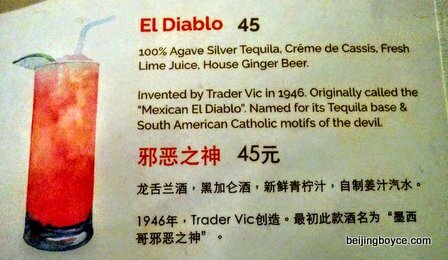 While CFM fiddled with tea punches, and oohed and awed over the French rums, I went for an El Diablo (see recipe below), a steal at 元35 as one of the night’s specials. 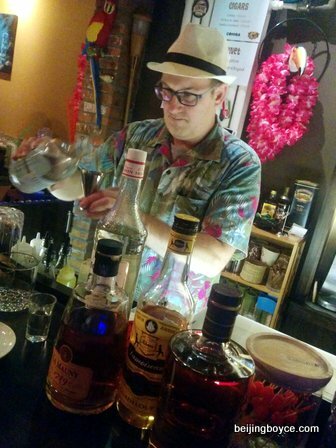 The colorful ceramic parrots and leis, not to mention the bartender’s Tommy Bahamas shirt, was a nice contrast to the dreary Beijing night. Bungalow is experimenting with infusions–I tried a tasty black pepper tequila that we further spiced with habanero oil. It also just got a bunch of Canadian whiskey, including the Crown Royal Northern Harvest Rye that has generated lots of buzz since being named the world’s best whiskey. 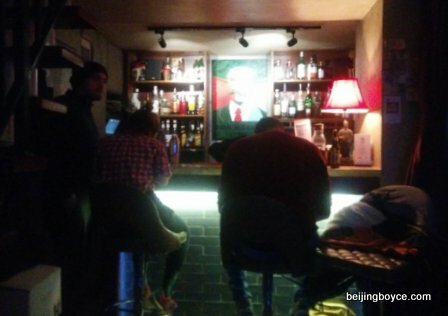 Fang Bar, a street over in Fangjia Hutong, also has a couple of bottles. 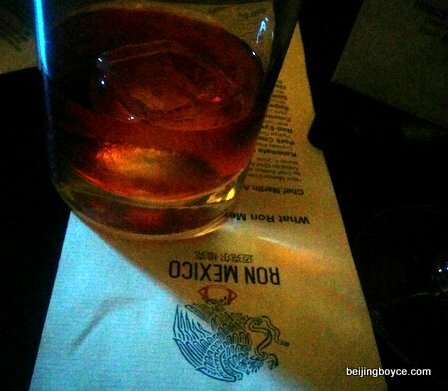 We next headed to Wudaoying Hutong to check out new bar Ron Mexico. This is a cozy two-floor venue with a focus on cocktails. The drinks we tried tended toward intensity: The Last Word includes gin and chartreuse and a lot of citrus bite while the Negroni was boozy and very dry. 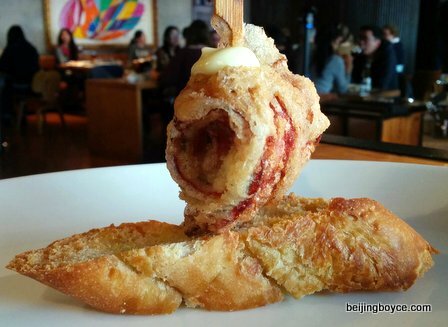 Of course, those can easily be tweaked to individual tastes. 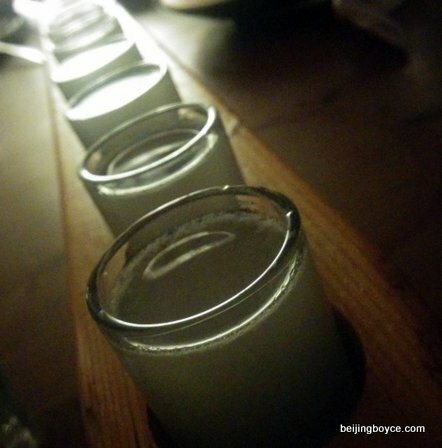 We also had a shot of baijiu that, well, as we were starting to feel the booze I didn’t understand the full details except that it involved a nuclear scientist and some radiation and is reportedly safe for human consumption. Ganbei! This place also offers draft beer–the Hash House guys we sat with were guzzling gallons of it–and snacks. 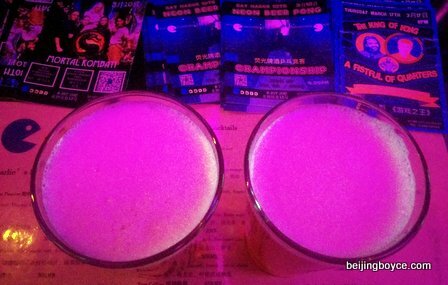 On our way to 8-Bit, we made a detour to Chill to visit bar veteran Lao Qi, known from former venues like Drum & Bell, Tun and Houhai Zoo. Given the history of those places, it was no surprise that a rack of shots–kamikazes–ultimately appeared. This bar lived up to its name as we relaxed for the better part of an hour before hitting the road. The new three-story 8-Bit is cool. 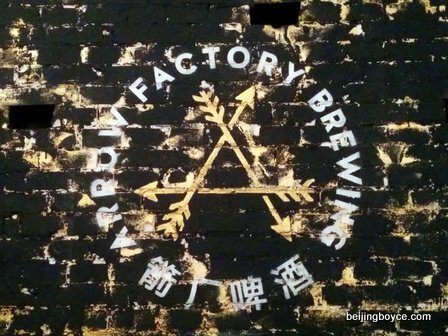 Get lost playing video games while sipping one of the four Arrow Factory craft beers, starting from 元35 per pour. What will make this place even better once spring arrives is the spacious rooftop. By the way, 8-Bit has 元30 cocktails and 元20 big bottles of Kirin on Tuesdays. Things were getting a bit fuzzy by this time. We stopped at Dada, where we grabbed a table and enjoyed Kirin draft, except for the 90 seconds that I did what I define as dancing, then grabbed some snacks at Temple, then made our way back to Cafe de la Poste. All in all, it was a good night that covered both some favorite spots and some new (at least to us) ones, that underscored how widespread local craft beer has become over the past few years, and that showed the wide range of options available in that area of town. I still have a dozen places on my list of places to check so expect a second pub crawl soon. haha nice one. 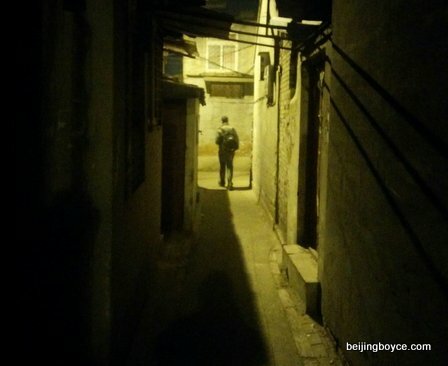 always wanted to do a personal pub crawl in the hutongs… your post got me inspired!